Somehow, the Ducks are in the NCAA Tournament. What seemed like a pipe dream just a couple of weeks ago is now a reality. Let’s look at how the Ducks got there, and more importantly, how they can advance, and become more than just a feel-good story. A conference on the rocks, a commissioner against the ropes and way too many teams not being competitive on the court … the embattled Pac-12 has played perfectly into the webbed foots of the Oregon Ducks. Duck fans rejoiced as Oregon sliced its way through four games to win the Pac-12 tournament and advance to the big dance. This run included victories over the three best teams in the conference, which is the first time it’s ever happened. Paul White gets fired up. Take nothing away from the Ducks; they came together as a team, upped their game and showed a resilience we may not have ever seen during the Dana Altman era. But playing in a conference that’s hitting rock bottom certainly didn’t hurt. The Ducks owe the Badgers some serious payback on the hardwood, as Oregon is 2-5 all-time against Wisconsin. The last meeting was a 72-65 loss in the round of 32 in the 2015 NCAA Tournament. And before that, the Ducks lost to Wisconsin in the same round in the 2014 NCAA Tournament, 85-77. Against common opponents, Wisconsin swept Iowa while the Ducks lost to the Hawkeyes, and both teams defeated Stanford. The Badgers’ best win this season came against Michigan (Tournament No. 2 seed) while the Ducks beat Syracuse (Tournament No. 8 seed). 4) No Bol Bol … A Blessing in Disguise? 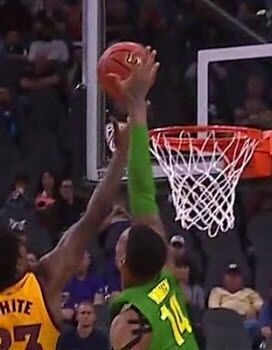 Bol Bol’s season-ending injury was no doubt tragic to the Ducks’ season, but on the bright side, it may have set the Ducks up to be a better team over the next couple of seasons. With Bol out, guys like Payton Pritchard, Francis Okoro, Miles Norris, Victor Bailey and Will Richardson all had to improve themselves in ways that they may not have had Bol been healthy. The early season Ducks often seemed content on passing the ball to Bol and then becoming on-court spectators. Initially after Bol’s injury, it seemed as if the whole team simultaneously regressed and forgot how to play the game altogether. But miraculously the season-ending surge occurred, and the team grew in ways that should benefit it come next season. Experience, especially for freshmen, is invaluable. Kenny Wooten does what he does best. Once Bol went down, the Ducks had become a team without a leader. This was painfully evident through the first half of the conference schedule. 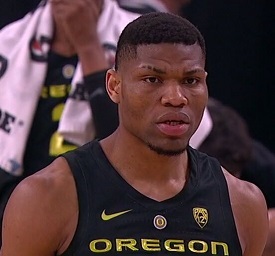 But during the Ducks late-season surge — as commentators Dave Pasch and Bill Walton noted during the Pac-12 tournament — Okoro stepped up as the emotional leader of this team, fueling the Ducks during their stretch run. The Ducks will have a hard time winning on Friday without an effective Louis King. King rested his ankle on Monday and practiced on Tuesday. All signs show that his knee should be fine, if not sore, come Friday’s game. 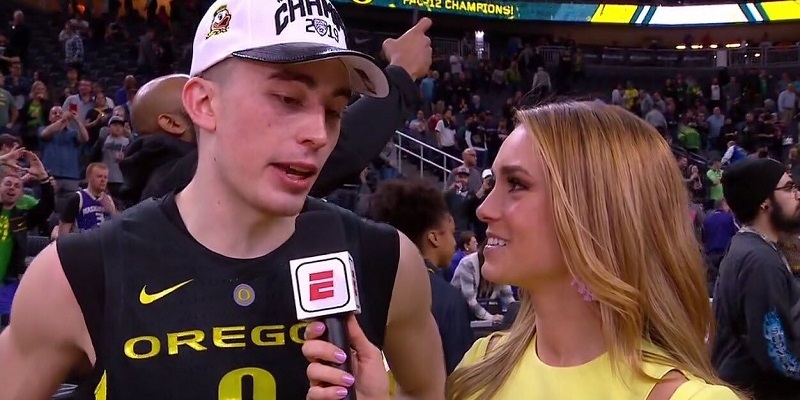 During the Ducks’ eight-game winning streak, Pritchard averaged 15.7 points, 4.9 assists and 2.7 steals while shooting 51 percent from the floor and playing more than 35 minutes per game. He scored 20 points against the Huskies, going 7-for-9 from the floor, dishing out seven assists and grabbing six rebounds. 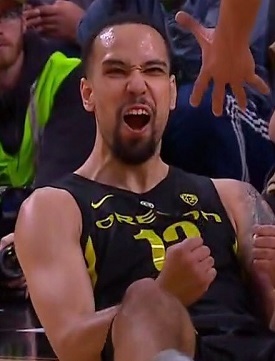 The visual that will stick with Duck fans was his electrifying left-handed dunk at the end of the game against Washington, which served as an exclamation point, not only for Saturday’s win, but for the Ducks’ season-ending surge as well. Francis Okoro has established himself as a team leader. After allowing UCLA to score 62 points in the second half on February 23rd, the Ducks held their next six opponents to less than 62 points for the entire game. Yes, defense wins — big time. Oregon’s recent defensive surge can be directly linked to a switch to the “big” starting lineup of four players standing at 6’9”. During the eight-game winning streak, the Ducks outscored their opponents by nearly 18 points per game, with an average score of 72-54. Both the Ducks and the Badgers rank in the bottom 30 nationally in adjusted tempo, and in the top 20 in defensive efficiency, which explains the lowest over/under of all the first-round games at 117 points. Both rank in the top 20 nationally in points allowed, top 25 in field-goal percentage defense and top 30 in three-point percentage defense. The player to watch for the Badgers is 6’10”, 237-lb. redshirt senior Ethan Happ. Happ was named first-team All-Big Ten while leading the Badgers in scoring (17.5), rebounds (10.1), assists (4.6) and steals (1.1). A month ago it looked like a lost season for the Ducks; now pundits are picking them to reach the Sweet 16. Whatever the big dance brings, the Ducks have gained momentum for the offseason, which may pay serious dividends in the seasons to come.